Gossip has it that Sweetcakes the bakerlady gnome, brought Troll and his pullet together with the magic of her muffins and the trail of crumbs that followed. The bond between bird and her bearded leader is forever: riding on her tricolored cart, she follows him everywhere. 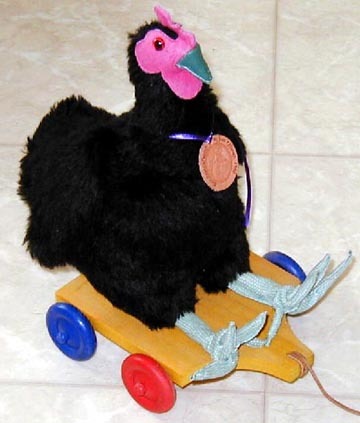 Bill Troll's pullet is a sleek black mohair chicken with fuchsia pigskin comb and wattle, and hazel glass eyes. She sits or stands on purple textured feet with bendable toes. She rides a yellow wooden cart with blue and red wheels and a leather pull cord.